Sarah (comment #202) – That tweet paid off! Mariposa (comment #22) – “Mama’s” got some candy coming her way! Jenny (comment #258) – No Pay Day yet, but maybe a Jokerz will do! Kevin King (comment #108) – Coconut sans hydrogenate oils, just as you requested! Heather (comment #151) – Another tweet win … ye shall be rewarded for making that extra effort! Have no fear if you don’t see your name. Go Max Go is working hard to distribute these yumilicious treats. 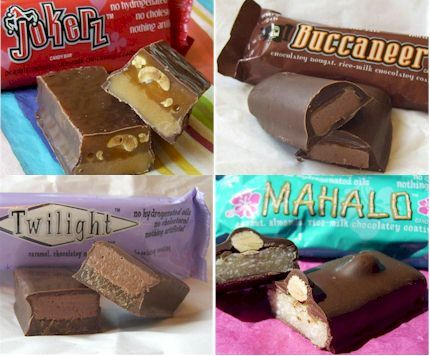 See their Where to Buy page for a retailer in your area or that can ship some candy bars directly to you! Meghan at Making Love in the Kitchen is hosting her second Green Smoothie Cleanse. It is a 3-day cleanse that will begin Sunday, June 7th. Meghan offers useful tools and information online, and you can live anywhere in the world and join in. Plus, she is giving aways some goodies for extra motivation! Angela at Oh She Glows is hosting Shop 4 a Cause to raise funds for the Canadian Cancer Society. You can support her event by donating an item for auction and/or bidding on items that catch your fancy on June 11th. I have contributed new copies of Go Dairy Free and My Sweet Vegan as prizes, but you can bet I will be on the bidding end too! Omigosh… this is fabulous… Thank you! Thank you! Thank you!